BarrowmanDay, which is on a Wednesday on Twitter, is run by @pagan_hare (Mickie), @Classic_Dame (Christina) and @ComicInks (Dana) and is a day to show our appreciation for the very talented John Barrowman. It was set up as as a way for fans to share their favourite pictures, videos, songs and web pages with others who may or may not know of these. Click on the "Twitter Follow Me" Button at top to follow us! On Devianart: We are also posting Fan Art, especially any non child friendly art at our new BarrowmanDay Devianart page here: http://barrowmanday.deviantart.com/ This is run by our newest staff member @comicinks (Dana) who has created comic herself. Do visit the 'Fan Art Gallery' page to see the criteria for submitting art work. Here we will post as much as we can of the items posted on the day. So if you missed them, don't worry, you should find it here :) We do hope you enjoy your visit here and that you share both this site and the twitter search with fellow John Barrowman fans! 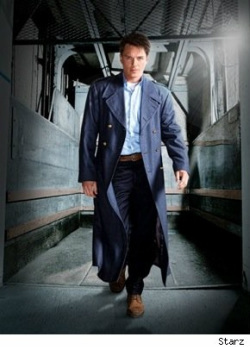 To find out more about us, click on "Meet The Barrowman Girls." Note About The Gallery's: Just wanted you all to know that if you click on the images they do open up larger and there is a small arrow at the bottom of the image to go to the next image! Enjoy! Ownership Disclamer: Barrowman Day does not claim to own any images, videos etc, that has been published on this site, unless otherwise stated. If you own anything here and wish us to remove it, please contact us through the below form. Comments Welcome: We would love to hear what you think of the site and so we have provided a contact form below. You can also use this form if you have any questions.